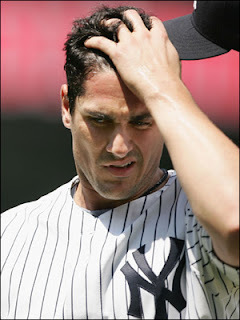 I guess that's enough of the Carl Pavano getting resigned talk, yes? Nice to Brodie Croyle staying in for 3 whole quarters before getting injured. Speaking of consistency...what were the Seahawks expecting when they signed Julius Jones? If he could only average 3.6 yds a carry last year behind Dallas' offensive line, did they expect better from him behind the Seahawk's line? Kellen Clemens won't be a Jet this time next year. Just a hunch. I'm sure Roger Federer, winner of his fifth straight U.S. Open, would like to personally thank each and every one of the writers who said he was finished, and tell them to kiss his posterior, softly and gently. Reggie Bush had a good day catching 8 passes out of the backfield, including a nice catch and run through the flat for a TD. But, even with a 26 yard run to his credit, Bush still only averaged 3.6 yards a carry and needed a guy named Pierre Thomas (who averaged 5.2 yards a carry) to cover him for the runs up the middle. Bush might be an exotic weapon for the Saints to utilize, but I can't see him ever being a reliable running back. The series of the Rays-Red Sox is really exciting and should be heck of a lot of fun to watch—but ultimately irrelevant, because the Angels take the AL, hands down. The official Andaplayertobenamedlater.com Man of the Week Award goes to Michael Turner of the Atlanta Falcons, for his completely sick day he had on Sunday. 220 yards on the ground, with 2 TDs and a whopping ten yards per carry average. Granted it was against the Lions, but still...an awesome day. Congrats, Michael. 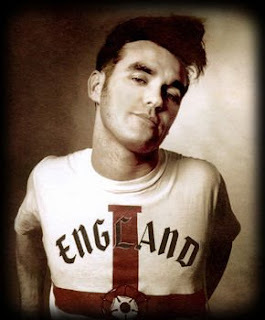 And finally...has anyone noticed the NFL Networks use of Morrissey's 'Every Day Is Like Sunday" as their new theme song. First of all, it's a lame faux-country, peppy remix of Morrissey's ballad of depression, now used as a rallying cry for football fans everywhere—sorta like using the Ramones "I Wanna Be Sedated" for a anti-depression drug commercial. Anyway, here are the lyrics for the song, and let me know if you think the NFL is retared for using this song. Bush is a slot receiver at best. They'd be better off moving him around as much as possible and avoiding the tailback role. He'd be more effective. I put Michael Wilbon was one of the most vocal about Federer the past month and half or so. Ever since he lost to Nadal in the French Open he has been saying that Federer would not win another major. Which I always found ridiculous. How can you say he will never win another one win he has been the finals of two majors before the US open and the semis in the Australian. Hey Pete. Agreed. Bush is a weapon that the Saints can move around to be most effective. Get him into some open space. And Wilbon must be an idiot. he only lost to Nadal 9-7 in the fifth set. how is that done? Utterly foolish. It's the same thing with Tiger when he was "slumping" for a while. "My goodness, he hasn't won a major in 9 months! His wife's too hot, she's taken away his edge. His swing isn't absolutely perfect anymore! He only has 18 top tens in the last 13 months!" Ridiculous. Federer lost on clay to a clay specialist and played the greatest match ever against a guy who did not make a mistake for 5 sets at Wimbledon.